Good ol' Beeb: just in time for Christmas it's made video streaming on your Google phone and tablet that much better. The new update to the platform is designed to make sure those receiving Android devices from Santa won't be short changed in the experience of watching Strictly Come Dancing. The first phase of the plan (which will come 'before Christmas') will see the stream optimised over Wi-Fi to provide smoother and higher quality streaming on Android devices. 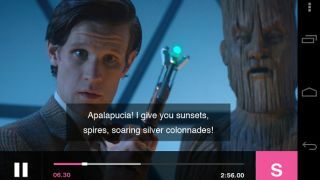 After that the BBC has promised a two-tier approach to Android to deal with the issue of fragmented devices, meaning lower quality video streaming for the less powerful handsets but high quality video (matching that on iOS) for the likes of the Samsung Galaxy S3 and Google Nexus 7, which are capable of rendering the improved video. The BBC is also promising support for Android Jelly Bean 4.2 before Christmas as well, meaning those new Nexus devices will be able to show Doctor Who when you've passed out and missed it on Christmas day. In 2013 the Beeb is pledging to manage network quality better as well, allowing for improved quality when streaming over 3G, 4G and Wi-Fi, enabling it to 'bring parity' properly between iOS and Android. It points to the stability of the range of iOS devices as the reason for the focus on Apple's products first, but has now pledged to invest more to make sure future updates will come to iOS and Android at the same pace. Sadly, there's no news on being able to download BBC programming to your Android device, something that's been around on the iPad for a while now, but fingers crossed the security concerns surrounding that get addressed in early 2013.